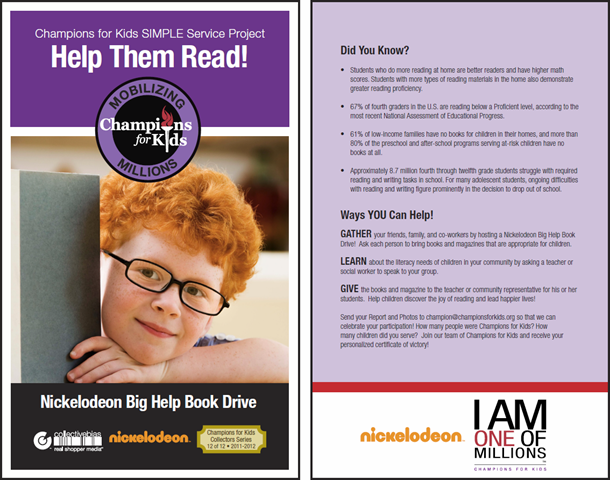 Champions for Kids: Help Them Read! • Students who do more reading at home are better readers and have higher math scores. Students with more types of reading materials in the home also demonstrate greater reading proficiency. • 67% of fourth graders in the U.S. are reading below a Proficient level, according to the most recent National Assessment of Educational Progress. • 61% of low-income families have no books for children in their homes, and more than 80% of the preschool and after-school programs serving at-risk children have no books at all. • Approximately 8.7 million fourth through twelfth grade students struggle with required reading and writing tasks in school. For many adolescent students, ongoing difficulties with reading and writing figure prominently in the decision to drop out of school. GATHER your friends, family, and co-workers by hosting a Nickelodeon Big Help Book Drive! Ask each person to bring books and magazines that are appropriate for children. LEARN about the literacy needs of children in your community by asking a teacher or social worker to speak to your group. 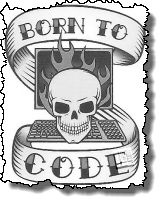 GIVE the books and magazine to the teacher or community representative for his or her students. Help children discover the joy of reading and lead happier lives! Send your Report and Photos to champion@championsforkids.org so that we can celebrate your participation! How many people were Champions for Kids? How many children did you serve? Join our team of Champions for Kids and receive your personalized certificate of victory! Champions for Kids: Help Them Learn! • More than 31 million students from low-income families receive free or reduced-price school lunches. Parents struggling to feed their children often find it challenging to buy project boards, pencils, crayons, scissors, and glue – items all kids are expected to have for school. • Teachers spend an average of $356 out-of-pocket on school supplies every single year, with many spending up to $1500 from their salaries just to provide basic classroom supplies such as paper and pencils that are necessary for learning. • The long-term implications of education for children are dramatic. According to the US Census Bureau, the average earnings for people with an advanced degree are $83,144, whereas the average earnings of those with a high school degree alone are $31,283. 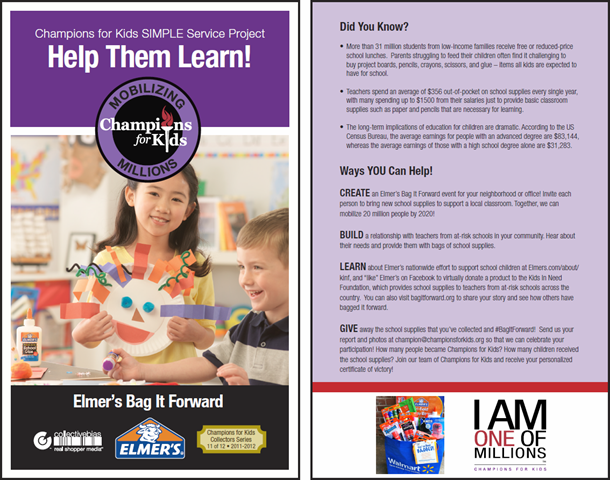 CREATE an Elmer’s Bag It Forward event for your neighborhood or office! Invite each person to bring new school supplies to support a local classroom. Together, we can mobilize 20 million people by 2020! BUILD a relationship with teachers from at-risk schools in your community. Hear about their needs and provide them with bags of school supplies. GIVE away the school supplies that you’ve collected and #BagItForward! Send us your report and photos at champion@championsforkids.org so that we can celebrate your participation! How many people became Champions for Kids? How many children received the school supplies? Join our team of Champions for Kids and receive your personalized certificate of victory! 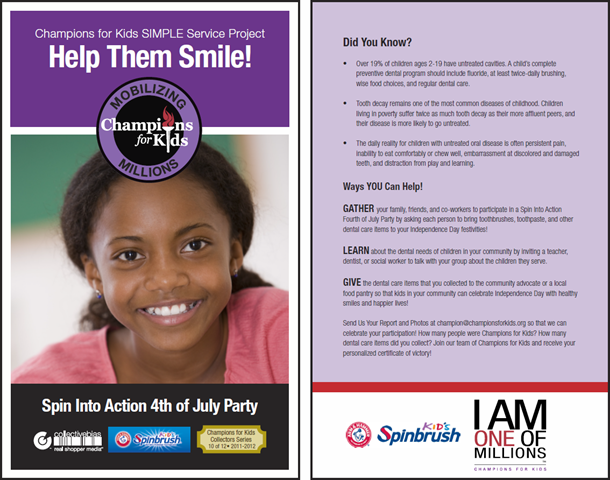 Champions for Kids: Help Them Smile! • Over 19% of children ages 2-19 have untreated cavities. A child’s complete preventive dental program should include fluoride, at least twice-daily brushing, wise food choices, and regular dental care. • Tooth decay remains one of the most common diseases of childhood. Children living in poverty suffer twice as much tooth decay as their more affluent peers, and their disease is more likely to go untreated. • The daily reality for children with untreated oral disease is often persistent pain, inability to eat comfortably or chew well, embarrassment at discolored and damaged teeth, and distraction from play and learning. GATHER your family, friends, and co-workers to participate in a Spin Into Action Fourth of July Party by asking each person to bring toothbrushes, toothpaste, and other dental care items to your Independence Day festivities! LEARN about the dental needs of children in your community by inviting a teacher, dentist, or social worker to talk with your group about the children they serve. GIVE the dental care items that you collected to the community advocate or a local food pantry so that kids in your community can celebrate Independence Day with healthy smiles and happier lives! Send Us Your Report and Photos at champion@championsforkids.org so that we can celebrate your participation! How many people were Champions for Kids? How many dental care items did you collect? Join our team of Champions for Kids and receive your personalized certificate of victory! 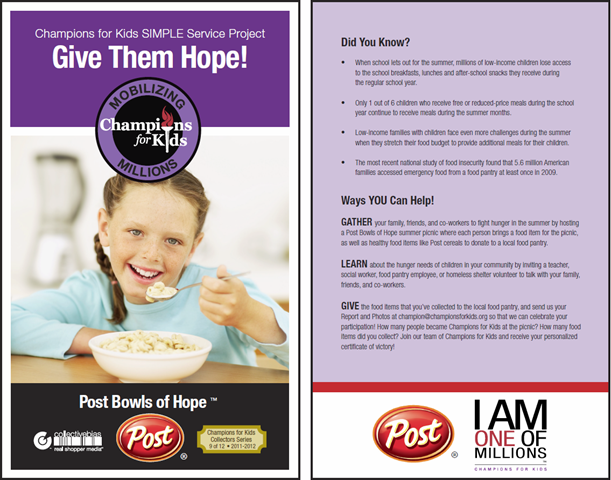 Champions for Kids: Feed Them Well! • 17 million children in the United States are food insecure, meaning that they do not know where or when they will receive their next meal. • Food insecure households are 15 times more likely than food secure households to have obtained food from a food pantry. Food insecure households are also 19 times more likely than food secure households to have eaten a meal at an emergency kitchen this year. • For many low-income children and families, food pantries provide a lifeline during the summer months when children no longer receive free school breakfasts and lunches. Because of this need, food pantries are often strained to provide more assistance to children and families who are struggling to put their next meal on the table. GATHER your friends, family, students, and co-workers by hosting a Summer Food Rally at your school, workplace, or community center. Ask each person to bring nutritious nonperishable food items to donate to a local food pantry in your community. LEARN about the summer hunger needs of children in your community by inviting a teacher, social worker, food pantry employee, or homeless shelter volunteer to talk with your friends, family, students, and co-workers. GIVE the food items that you collected to a local food pantry to help kids have a happier and healthier summer! Send us your Report and Photos at champion@championsforkids.org so that we can celebrate your participation! 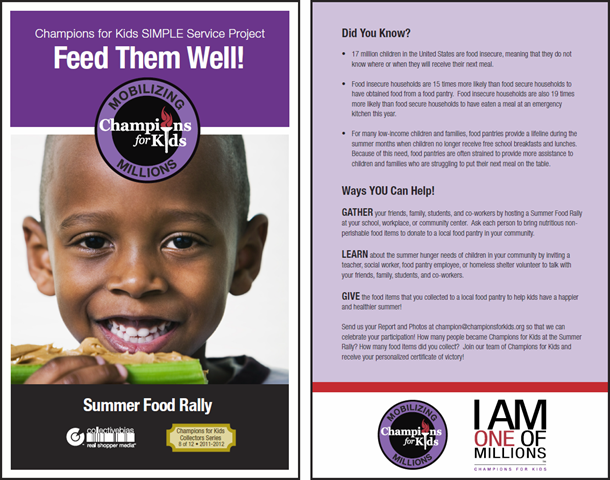 How many people became Champions for Kids at the Summer Rally? How many food items did you collect? Join our team of Champions for Kids and receive your personalized certificate of victory! 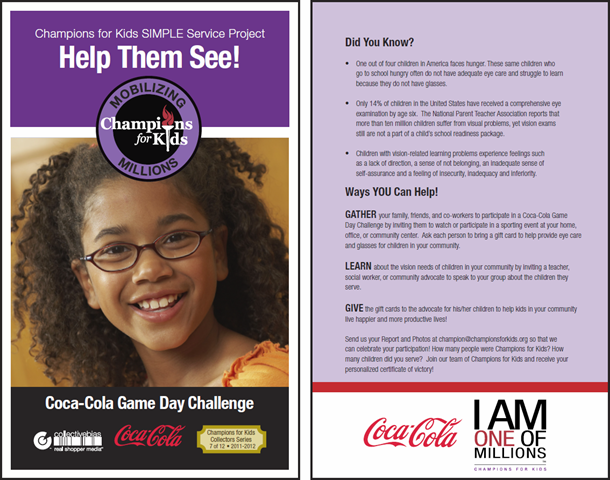 Champions for Kids: Help Them See! • One out of four children in America faces hunger. These same children who go to school hungry often do not have adequate eye care and struggle to learn because they do not have glasses. • Only 14% of children in the United States have received a comprehensive eye examination by age six. The National Parent Teacher Association reports that more than ten million children suffer from visual problems, yet vision exams still are not a part of a child’s school readiness package. self-assurance and a feeling of insecurity, inadequacy and inferiority. GATHER your family, friends, and co-workers to participate in a Coca-Cola Game Day Challenge by inviting them to watch or participate in a sporting event at our home, office, or community center. Ask each person to bring a gift card to help provide eye care and glasses for children in your community. LEARN about the vision needs of children in your community by inviting a teacher, social worker, or community advocate to speak to your group about the children they serve. GIVE the gift cards to the advocate for his/her children to help kids in your community live happier and more productive lives! can celebrate your participation! How many people were Champions for Kids? How many children did you serve? Join our team of Champions for Kids and receive your personalized certificate of victory! 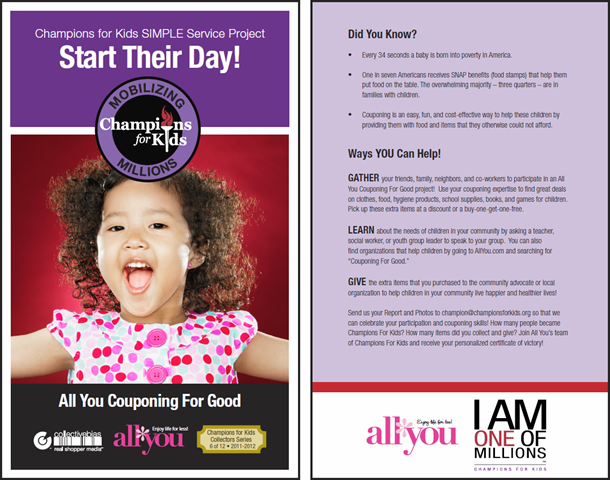 Champions for Kids: Start Their Day! • Every 34 seconds a baby is born into poverty in America. put food on the table. The overwhelming majority – three quarters – are in families with children. • Couponing is an easy, fun, and cost-effective way to help these children by providing them with food and items that they otherwise could not afford. GATHER your friends, family, neighbors, and co-workers to participate in an All You Couponing For Good project! Use your couponing expertise to find great deals on clothes, food, hygiene products, school supplies, books, and games for children. Pick up these extra items at a discount or a buy-one-get-one-free. organization to help children in your community live happier and healthier lives! Send us your Report and Photos to champion@championsforkids.org so that we can celebrate your participation and couponing skills! How many people became Champions For Kids? How many items did you collect and give? Join All You’s team of Champions For Kids and receive your personalized certificate of victory!